Woodland pottery vessel and arrow points. During the Woodland Era, crop raising began to replace hunting as a key food-producing activity. Increased use of domesticated grains (often cooked into porridges and stews) brought about a "container revolution." 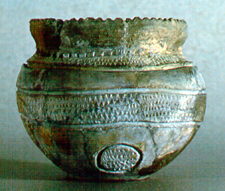 Many kinds of fired clay pottery vessels appear in the archeological record of the Woodland era. At first, only a few basic jar and bowl forms were made with minimal or no decoration. Over time, pottery making developed into an elegant craft, with exquisitely decorated specimens in a variety of forms. Woodland people also invented the bow and arrow, which proved so superior to the dart and throwing stick that it was quickly and widely adopted as the weapon of choice for hunting and warfare. Rock art, both petroglyphs (carved) and pictographs (painted), occurs at many archeological sites that have bedrock outcrops or large boulders. Motifs representing human, animal, bird, and insect figures, and also geometric and abstract forms correspond to Woodland and Mississippi period designs on portable artifacts such as pottery. Archeologists believe most rock art was made as part of individual (e.g., vision quest) and group (e.g., thanksgiving and renewal) rituals performed to create and maintain relationships between humans and the spirit world. 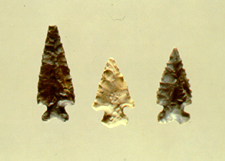 Woodland Indians continued the broad spectrum economy of their Archaic era predecessors. Major food producing activities included hunting and trapping, fishing, wild plant food gathering, and gardening. The gathering of wild plant foods (especially nuts) and gardening became more important, taking away from the time and effort devoted to hunting and fishing in earlier periods. After A.D.500, corn—which had been domesticated in Central America beginning around 6000 B.C.—made its way into the Mid-South. At first people grew it only in small amounts. 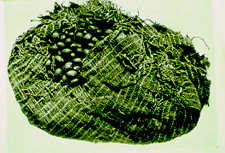 Woodland Indians improved their food storage technologies so they could more effectively store the abundant harvest of plant foods for use during leaner seasons. For example, large caches of harvested nuts and seeds were stored for long periods in covered pits excavated into the sediments of dry rock shelters. Jerry Hilliard studied some of these preserved caches, and found that Indians often lightly roasted the seeds and nuts before they were stored to prevent insect infestation. The increased reliance on plant food production affected Woodland settlement and land-use patterns. A good example of this was documented in excavations by George Sabo and Randall Guendling at the Dirst site along the Buffalo River in north-central Arkansas. The site was occupied intermittently during the Dalton, Late Archaic, and Early Woodland periods by groups of seasonally mobile hunters and gatherers. The site was then occupied between A.D. 600 and 900 by a sedentary Late Woodland community that supported itself by deer and elk hunting, fishing, nut and wild fruit gathering, and garden cultivation of chenopodium, little barley, maygrass, knotweed, squash, and corn. The Dirst site location was strategically located to assure access—even under periodic flood conditions—to small, dispersed bottomland habitats containing the only fertile soils in the region. The Dirst site occupants also experimented with making and using shell-tempered pottery vessels. “Tempering” means adding some substance to the clay to give it body and make it stronger. Earlier Woodland pottery was grit tempered using sand or crushed rock. Shell tempered ceramics can better withstand the thermal shock of direct exposure to fire. This new type of pottery was a handy development relative to the increased use of dried grains in the diet, which require prolonged boiling. Excavations at the Dirst site also provided information on changes in dwelling architecture. The Early Woodland occupants of the site constructed light, circular pole frame dwellings. The Late Woodland occupants built more substantial square structures with internal hearths and food storage pits. Woodland trade networks distributed exotic raw materials and finished ceremonial artifacts all across eastern North America. During the Middle Woodland period, these networks were part of an interregional "ceremonial cult" represented by the Hopewell culture, which originated in the Ohio River valley around 200 B.C. The most remarkable feature of this culture was the practice of burying community leaders beneath conical earthen mounds. Some of these burials were accompanied by hoards of elaborately decorated artifacts. The mortuary program seems to have functioned primarily as a means for local communities to renew and solidify social ties through collective rituals honoring their ancestors. Hopewell artists applied extraordinarily complex compositions to a variety of objects including sandstone tablets, ceramic vessels, and cut-out mica sheets. Some of these artifacts illustrate birds and other animals possessing unusual characteristics, indicating they were conceived as supernatural rather than ordinary creatures. Stone and ceramic smoking pipes were another medium for depicting animals, birds, and insects. Most of these are naturalistic but some also incorporate extraordinary features symbolizing supernatural qualities. These examples show how Hopewell artists gave explicit recognition to the importance of the spirit world in the realm of human affairs. In addition to these portable objects, Woodland Indians invested enormous amounts of labor in the construction of hundreds of monumental earthworks. Among the more famous are the Serpent Mound and Newark Earthworks in Ohio. The sinuous Serpent Mound is an effigy of a huge serpent extending for nearly a mile. The Newark Mound consists of gigantic geometric enclosures oriented to tracks inscribed across the sky by the paths of the moon, and suggests the emergence of a new concern with the link between human activities and cyclical movements of heavenly objects thought to represent important spirit beings or supernatural forces. Hopewell ceremonialism spread into many areas. Participants built thousands of effigy and burial mounds across eastern North America. The influence of Hopewell ceremonialism in Arkansas was seen at the Helena Mound site, near the confluence of the Mississippi and St. Francis rivers. (The site no longer exists.) Here, several community leaders and their heirs were buried in massive log tombs covered by conical-shaped earthen mounds. One of the burials was of an adolescent female whose grave goods included a copper and silver covered panpipe, copper ear spools, a drilled wolf canine and shell bead belt, and pearl and marine shell bead armbands, bracelets, and necklaces. In addition to burial and effigy mounds, some Middle Woodland communities constructed ceremonial centers containing mounds and earthworks that served to demarcate sacred space. Robert Mainfort conducted extensive studies at the Pinson Mounds near Memphis, Tennessee, where Middle Woodland communities built a dozen mounds within a 160-hectare area. The largest mound was a flat-topped, pyramidal structure 22 meters tall. Mainfort found no evidence of structures built upon its surface. Nor did he find any evidence of permanent occupation at the site. It appears that the Pinson mound center was used by local groups who gathered on special occasions to perform collective rituals in a specially constructed landscape. by Jane Kellett (Arkansas Archeological Survey). 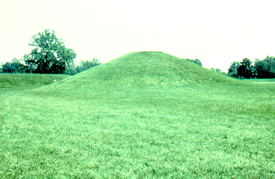 Martha Rolingson discovered a somewhat different use of mounds and earthworks at the Late Woodland Toltec Mounds near Scott, Arkansas, preserved today as part of Toltec Mounds Archeological State Park. This site actually has nothing at all to do with the Toltec Indians of Mexico, but a nineteenth century landowner mistakenly believed that the earthworks at the site were built by ancient Mexican mound builders and so the site came to be known as the "Toltec Mounds." 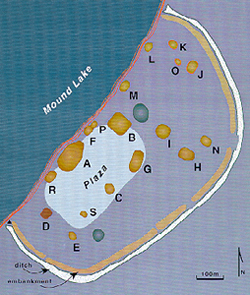 Here, people of the archeologically defined Plum Bayou culture (A.D. 600-1000) constructed at least eighteen earthen mounds across a large, flat plain surrounded on three sides by a mile long earthen embankment and ditch complex and on the fourth side by Mound Pond, a relict segment of an earlier Arkansas River channel. Many of these mounds are pyramidal in shape with a flat upper surface intended not to cover burials but instead to support buildings. The Natchez Indians, who continued to use platform mounds during the historic period, typically built temples, mortuary houses, or other shrines on the elevated surfaces of these mounds, which served as focal points for community rituals conducted by high status leaders. Artist’s concept of a Plum Bayou culture solstice ceremony. Courtesy Arkansas State Parks. Excavations confirmed the presence of buildings on at least some of the platform mounds at the Toltec site. Additionally, several mound and embankment features at Toltec form an astronomical observatory, aligned to the solstice and equinox positions of the rising and setting sun. This suggests that the Plum Bayou people, like their Middle Woodland predecessors, attached importance to synchronizing their own activity cycles with the cyclical movements of heavenly objects. Thus, Woodland era culture has many continuities with earlier traditions, as well as striking elaborations, some of which introduced novel applications of art into belief systems and associated rituals. This new vision of the world went beyond the “naturalistic” portrayals of the Archaic period. In Woodland art, spirit beings are depicted as living creatures possessing extraordinary characteristics. A growing concern to integrate human activities within a larger cosmological system is seen in the earthworks—constructed in geometric and animal forms—that shaped Woodland landscapes and served to connect earthly activities with the cyclical movements of heavenly objects. 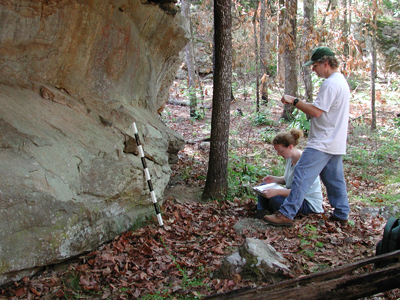 Through time, the success and continued growth of these Late Woodland communities led to unprecedented levels of social and cultural complexity, giving rise to the Mississippian cultures of the late prehistoric era. Anderson, David G. and Robert C. Mainfort, Jr.
2002 The Woodland Southeast. Tuscaloosa, University of Alabama Press. 1988 Middle Woodland Ceremonialism at Pinson Mounds, Tennessee. American Antiquity 53(1):158-173. 1990 Archeological Investigations at 3MR80 Area D in the Rush Development Area, Buffalo National River, Arkansas, Volume 1. Southwest Cultural Resources Center Professional Papers No. 38, Sante Fe.